The DVD, Saint to Santa: How Saint Nicholas Became Santa Claus (Pauline Books & Media, $19.95, 36 MINUTES, ISBN: 0-8198-9042-1) is available at all Pauline Books & Media Book Centers, or call TOLL FREE at 1-800-876-4463. 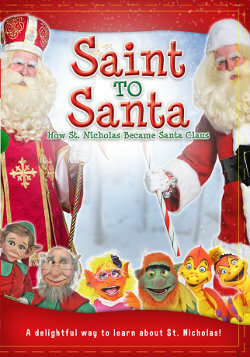 Saint to Santa offers a unique behind the scenes view of a television show created by children accompanied by six original puppet characters created by puppeteer, Fr. Joseph Marquis. Discover how a beloved Christian saint became Santa Claus, as Saint Nicholas tells his own story! The script is co-authored by the gifted six time Emmy Award winning director, producer and author, Chris Stepien (“Three Days: The Search for the Boy Messiah”), and Fr. Marquis, an Emmy Award winning Santa Claus and founder of the St. Nicholas Institute, is pastor of Sacred Heart Byzantine Catholic Church; Livonia, MI. With children cueing the action, along with a host of zany puppets running the studio, Saint to Santa will prompt giggles and cheers for the kind saint whose joy reminds us that Christmas is the birthday of Christ our Savior. NOTE: All profits realized from the sale of the “Saint to Santa” DVD benefits the ministry of the St. Nicholas Institute and Sacred Heart Byzantine Catholic Church, Livonia, MI.